Why Is Parts Availability so important to your customers and what can you do to improve it? Your customers purchase equipment from you to make money. If the equipment is working it is generating money for them. 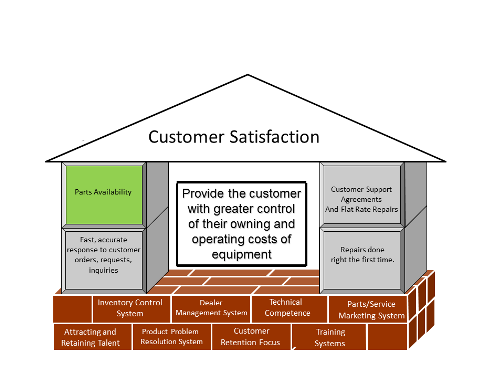 Having the right parts at the right time allows your customer to continue the work that generates income for them. 1. Create a machine population list by model and serial number and keep it up to date. 2. Create a recommended spare parts list for each machine model; review this list every quarter to adjust your inventory levels accordingly. 3. Ask the manufacturer that your dealership represents if they have created a “Parts Consumption List” for each machine in your territory. If you are able to get such a list, review it by comparing your on-hand stock with the consumption list. 4. Review Parts sales history to find any impact for seasonal sales. I recommend you create a list for the past three years and review the list by each quarter of activity. This approach will help you determine the effect of seasonality. 5. Review all parts that have been back ordered (stock-outs) over the last 12 months. Determine any trends or common back orders. You may be able to improve availability by increasing the quantity ordered. 6. Create Parts kits for common repairs and/or maintenance. Be certain to always have these Parts in inventory. 7. Review with the Service department the Parts they use for common repairs and maintenance. 8. Create a list of all parts by sales activity for the past 12 months. Break this list down in ascending to descending order based on sales activity. a. Create a list of all Parts that have been determined to be obsolete or excess in your inventory. With obsolete Parts remove and scrap those Parts every quarter throughout the year (I highly recommend that the Parts department budget 2% of sales volume to cover the cost of obsolescence). This will free up needed space in your warehouse. b. With excess inventory work with your supplier/manufacturer to return these parts and replace them with fast moving Parts. This not only will improve availability most suppliers/manufacturers are willing to replace slow moving inventory if it is equal in value to the Parts you are returning. c. Create a “Back Order Recovery System”. Your Parts department will always have back orders. It is unreasonable to expect 100% fill rates on every Parts order. d. Track the back orders on a daily basis and establish a system by which you expedite the back orders generated every day. e. My instructions to the Parts staff was with every back order we must determine when the back order would be filled and the customer was always contacted to advise them of when the back order would be shipped. These simple steps will improve parts availability and drive customer satisfaction to very high levels. Parts Availability is the customers first choice when looking for the best dealership to do business with.